Welcome to our very first Show Notes post! You didn’t think we were really going to post them, did you? Yesterday on A Good Habit we talked about the sacrament of reconciliation, prompted by Pope Francis’ call to make confession available for everyone during a day he called “24 Hours for the Lord.” You can read more about that, and read his prepared remarks, here. The novena we have been praying can be found below, along with information on the priest who started it, Fr. Dolindo Ruotolo. Just looking around the internet for more information about him, we discovered a couple of books he wrote: Come, Holy Spirit and A Month With Mary. Some of his writings and meditations can be found here. His spiritual daughters recall that when Don Dolindo went to the printery to order the first issues (of his immense commentary on the Bible), having given away the little money that he had scraped together, he said with his habitual candour, “The Providence of God will look after the rest, since I don’t have any money at all.” Hearing this, the printer retorted, “Padre, what are you saying to me? If you don’t have the money to publish, I’m doing nothing. It’s all well and good to say that Providence is going to pay.” Don Dolindo defied him. “Do the printing, and you will be paid down to last penny! I guarantee it in the name of God.” The printer came back with, “But I don’t do jobs trusting in prophecies about the help of God!” Don Dolindo replied, “Trusting in the help of God, I tell you that I will pay you for all the work and buy your print shop from you on top of it!” Don Dolindo did not buy the print shop, but he was always punctual in paying for the printing. The above was found at Vultus Christi, and you can read more from his biography (and the rest of their post) here. Here is the Novena of Surrender. Praying it has been both enlightening and comforting. Enlightening as we recognize areas in which our trust in God is lacking, comforting as we come to a deeper understanding of how much God loves us, and how solicitous He is for all our needs and troubles. We love it so much it will probably become a perpetual novena for our community. How many things I do when the soul, in so much spiritual and material need turns to me, looks at me and says to me; You take care of it, then close its eyes and rests. In pain you pray for me to act, but that I act in the way you want. You do not turn to me, instead, you want me to adapt to your ideas. You are not sick people who ask the doctor to cure you, but rather sick people who tell the doctor how to. So do not act this way, but pray as I taught you in the Our Father: Hallowed be thy Name, that is, be glorified in my need. Thy kingdom come”, that is, let all that is in us and in the world be in accord with your kingdom. Thy will be done on Earth as it is in Heaven, that is, in our need, decide as you see fit for our temporal and eternal life. If you say to me truly: Thy will be done. Which is the same as saying: You take care of it. I will intervene with all my omnipotence, and I will resolve the most difficult situations. You are sleepless; you want to judge everything, direct everything and see to everything and you surrender to human strength, or worse- to men themselves, trusting in their intervention,- this is what hinders my words and my views. Oh how much I wish from you this surrender, to help you and how I suffer when I see you so agitated! Satan tries to do exactly this: to agitate you and to remove you from my protection and to throw you into the jaws of human initiative. So, trust only in me, rest in me, surrender to me in everything. I perform miracles in proportion to your full surrender to me and to your not thinking of yourselves. I sow treasure troves of graces when you are in the deepest poverty. No person of reason, no thinker, has ever performed miracles, not even among the saints. He does divine works whosoever surrenders to God. So don’t think about it any more, because you mind is acute and for you it is very hard to see evil and to trust in me and to not think of yourself. Do this for all your needs, do this all of you and you will see great continual silent miracles. I will take care of things, I promise this to you. Don Dolindo Ruotolo was a Neapolitan priest (1882-1970), stigmatized miracle worker and “mouthpiece of the Holy Spirit”. To read a longer biography about Fr. Ruotolo click here. We hope you find the novena helpful. Please know that we will include each of your intentions in our novena. This entry was posted in A Good Habit, Pope Francis, Prayer, Saints & Angels and tagged 24 Hours for the Lord, A Good Habit, confession, Fr. 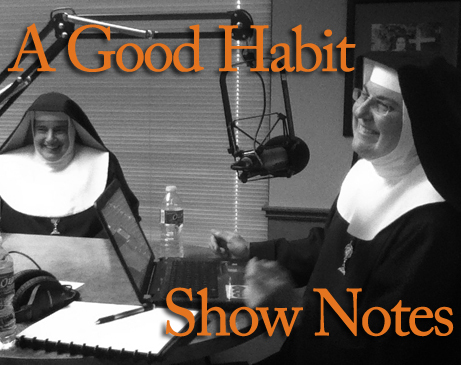 Dolindo Ruotolo, Novena of Surrender, Pope Francis, radio, Show Notes by texasnuns. Bookmark the permalink.